Part of a complete line of high-performance mufflers, cat-back systems, mandrel bent high-flow pipes and installation accessories. 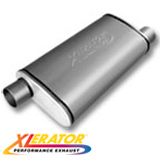 Mufflers are produced from heavy gauge, high quality stainless steel. Advanced technology high temperature filler material. Stainless steel tubular liner prevents blowouts. Use on single or dual performance upgrades. Designed to deliver superior flow and maximum power. Deep mellow tone without unwanted cabin noise. Direct fit high performance systems.